Elizabeth Falwell has been writing for the TV news industry since 2005. Her work has appeared on WXII 12 News, WMGT 41 News, NewParent.com and multiple parenting blogs. A graduate of the S.I. Newhouse School at Syracuse University, Falwell holds a Master of Science in broadcast journalism. Of the four competition strokes in swimming -- backstroke, breaststroke, butterfly and freestyle -- breaststroke is the slowest. For example, the world record for the men's 100-meter breaststroke is just 58.46, while the world record for the men's 100-meter freestyle is 46.9. However, improving your basic technique helps to increase your breaststroke speed. Practice your arm movements before you go into the water by bending your arms at the elbows and bringing the backs of your hands together just under your breastbone. Push your hands together forward until the bend of each arm forms an obtuse angle. As you continue the forward push, begin a sweeping and sculling motion with your hands until they are approximately shoulder-width apart. Begin flexing your elbows and pushing downward with your hands as you sweep your hands back to the starting position. Put it together with leg movements in the water. Begin by floating on your stomach with your arms together and extended straight in front of you. Also extend your legs straight behind you. Your head should be between your arms, with your face looking at the bottom of the pool. Sweep your arms around, bringing them under your collarbone. As you do this, simultaneously raise your head out of the water and begin the kick. Keeping your feet relaxed, bend your knees as you bring your heels toward your buttocks. Do not bend at the hips. The position of your thighs should not change during this initial movement. Extend your arms back in front of you to their starting position as you lower your head back into the water. As you do this, finish the kick -- which propels you forward -- by whipping your feet around in a half-circle and back to their starting position straight behind you. Glide briefly, and then begin a new breaststroke. Add a slight undulation to the stroke using your hips. As you sweep your arms under your collarbone and bring your feet toward your buttocks, use this forward momentum to thrust your hips forward. As you complete the kick, release your hips, allowing them to float back to the surface. This increased thrust on the horizontal axis increases your propulsion through the water. Lunge forward as you extend your arms back to the starting position, rather than simply letting them slide out gently. Increasing the speed of this extension will increase the length of each stroke, which further increases your speed. Arch your upper back slightly as you initiate the arm pull using the sweeping, sculling motion by pressing your chin and chest down and forward. This arch helps prepare your body to thrust your hips forward. Time your breaststroke correctly. Novice breaststrokers often perform the arm pull and leg kick separately; when you integrate the two movements together, you increase the stroke's efficiency and your speed. Train outside of the pool to increase your muscle strength. Breaststroke uses all the major muscle groups in the legs, but especially the glutes, hamstrings and quads. Exercises such as leg extensions, squats and lunges increase the size and endurance of these muscles, giving you more power in the water. 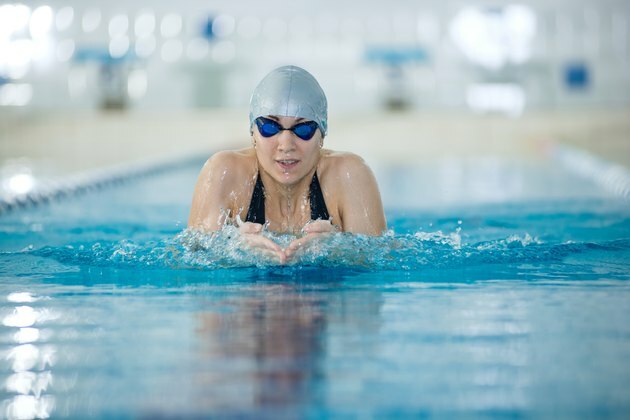 The breaststroke kick puts strain on knee ligaments such as the medial collateral ligament and anterior cruciate ligament. If you experience pain in these ligaments, consult your doctor to avoid a condition known as breaststroker's knee.